The Healthy Food Combo Pack offers flexibility in planning your lunch menu. If you can't decide whether to have a sandwich or salad, you can take both. The Healthy Food Combo Pack includes a Lunch on the Go container to hold your sandwich and a Salad Shaker with separate dressing dispenser. 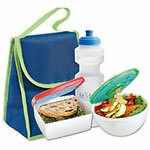 Both plastic food containers include a removable ice pack to keep food fresh and chilled until mealtime. In additon, you'll receive a free Chilled Shaker cup so that you can take your favorite protein drink or beverage with you on the go. 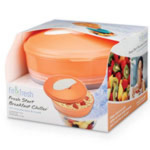 All FIt & Fresh products are easy to clean, freezer, microwave and top rack dishwasher safe (excluding ice packs). Do not microwave the ice packs. 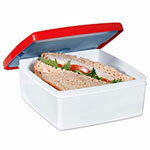 These food storage containers meet FDA regulations for food grade plastic.